If you are missing a tooth, you may have the choice between a dental implant and a dental bridge. Both options have advantages and disadvantages, so it is important to be informed. This will allow you to select the option that truly meets your needs and goals. 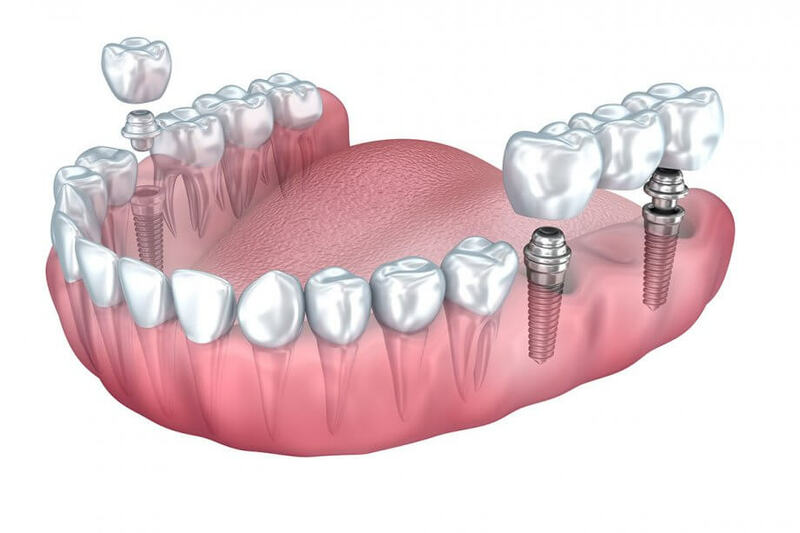 A dental implant is a small portion of titanium that is inserted into the jawbone, replacing the tooth roots. It takes two to four months for the implant to connect with the jawbone, creating a strong and stable base for a highly realistic replacement tooth. Often, you can have a temporary tooth placed immediately. Natural appearance and function: Highly aesthetic and functional, dental implants look, feel, and function just like natural teeth. You brush and floss them the same as your natural teeth. Jawbone health: When a tooth is missing, jawbone deterioration is the natural result. A dental implant preserves the jawbone by replacing the tooth roots. Preserving adjacent teeth: A dental bridge is anchored to the adjacent teeth, which must be shaved down for crowns. A dental implant stands alone, causing no damage to the surrounding teeth. It is the best tooth replacement for a single tooth. Virtually maintenance-free: With twice-annual dental visits and careful oral hygiene, a dental implant can last a lifetime. Surgery: Although it is a minor surgery, dental implant placement carries the same minimal risks as any other oral surgery, including infection or loosening of the implant. Implants have a 95% success rate, but, unfortunately, 5% do not work. At OMA, we have an implant replacement policy for those 5% and your surgeon will discuss that process with you. Time: Bone heals slowly. Unless we can offer a solution to give you an immediate temporary tooth, you must use another temporary solution for three to six months. Your surgeon will discuss that with you as well. A dental bridge spans the gap where one or more teeth are missing. A dental bridge is anchored to the natural teeth at each end. A traditional bridge is secured by crowns on each adjacent tooth. Speed: A dental bridge needs just two dental visits and is completed in a few weeks. First, the natural teeth are prepared and impressions are sent to the dental lab. When the bridge is ready, you simply return to the dentist to have it cemented to your teeth. Adjacent Tooth Damage: A fair amount of healthy tooth structure must be removed from the neighboring teeth to anchor the bridge. This increases the risk of tooth decay and even fracture to completely healthy teeth. Less Aesthetic: Although dental bridges can be reasonably aesthetic, they connect the teeth to each other. A dental implant is not connected to the adjacent teeth, providing a more natural appearance. Periodic Replacement: While dental implants can last a lifetime, most dental bridges will fail in a decade or so. Difficulty Cleaning: Because a bridge does not replace the root structure of the missing tooth, you have to pay special attention to cleaning that area. It often requires different tools to clean under your bridge. There are no “one size fits all” solutions in dentistry. Talk to your dentist and oral and maxillofacial surgeon about your needs and goals to learn which solution is best for you. With four locations in Oklahoma, OMA provides a full range of simple and complex oral and maxillofacial surgical services. Contact the nearest location at 405-848-7994 (Oklahoma City), 405-292-8900 (Norman), 405-733-4296 (Midwest City), or 405-341-4022 (Edmond) to schedule your initial consultation.